WASHINGTON (Army News Service) -- "Nurses are the cornerstone of medical care. They are all about the care of the patient. They are the golden children of patient care," said Col. Sandra McNaughton. McNaughton, who serves as the senior nurse executive at the Army's Office of the Surgeon General, has been a nurse for 28 years now. 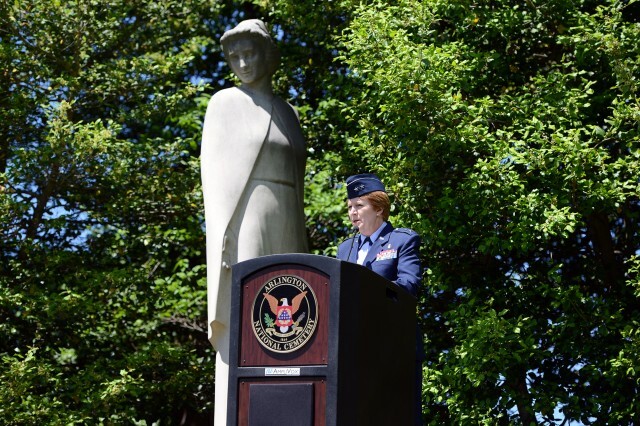 She was one of four military nurses who laid a wreath Monday at the Nurses Memorial at Arlington National Cemetery during the start of National Nurses Week. "I just really love caring for others," McNaughton said. "My mom was a nurse for probably 38 years. And I have just always had a true desire to take care of others." While she might have served as a nurse in the private sector, McNaughton said, she chose the Army to practice because she knew it would offer more of a challenge for her. "It serves such a bigger mission," she said of Army nursing, saying that she knew going in she would get to take care of Soldiers, which is something she wanted to do. She also knew that, as an Army nurse, she'd be on call to deploy at a moment's notice, if needed. And that too appealed to her. "It's a huge challenge," she said of being a nurse in the Army. "And it offers all these opportunities that a civilian nurse may not have." McNaughton, along with Air Force Maj. Gen. Dorothy Hogg, the deputy surgeon general for the Air Force and chief of the Air Force Nursing Corps; Air Force Col. Deedra Zabokrtsky, director of Air Force Nursing; and Navy Capt. 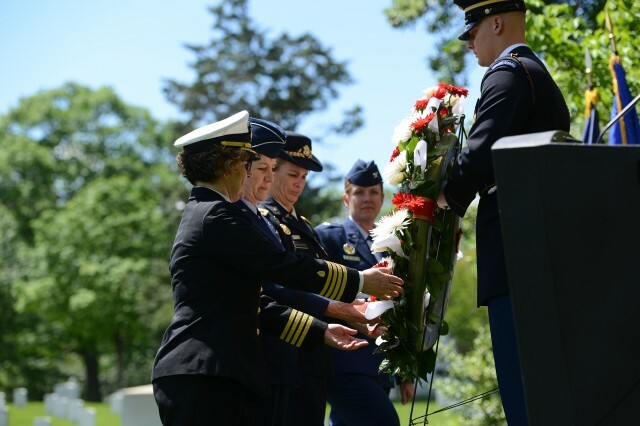 Deborah Roy, deputy chief of nurses for the Navy, participated in laying a wreath at the Nurses Memorial in Section 21 of Arlington National Cemetery. In that section of the cemetery, hundreds of military nurses have been laid to rest. "For more than two centuries, military nurses have served America, on the water, in the air and on land, in conflicts stateside and abroad," said Hogg, who offered remarks before participating in laying the wreath. "However, it wasn't until [the] establishment of the Army, Navy and Air Force nurse corps that military nurses were trained, paid and recognized as a necessary part of the U.S. fighting force." Today, Hogg said, wherever military medicine exists, military nurses are involved in some way. "Military medicine takes on the biggest and toughest missions in every corner of the globe," Hogg said. "It performs research, it educates tens of thousands of students per year, and it responds to disasters and performs heroic humanitarian work. But no matter how varied the mission, one constant is military nurses. 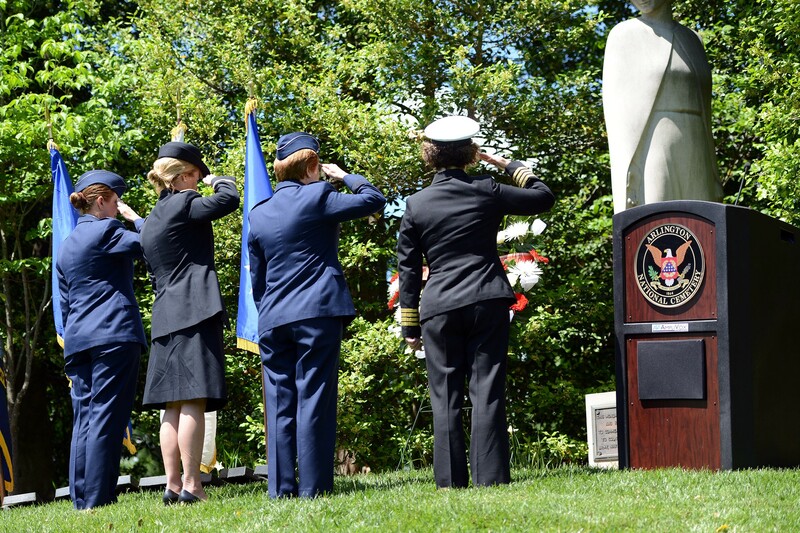 The perseverance of all these military nurses, from all walks of life, paved the way for us to serve in various capacities and roles around the world: from the front lines to our hospitals and in our research labs. 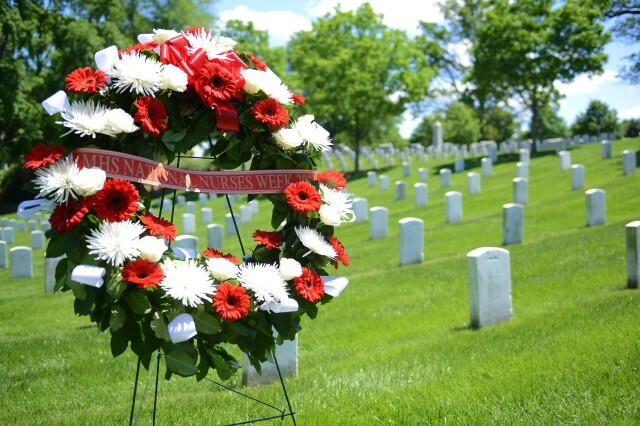 "Today in Section 21 of Arlington National Cemetery, this sacred place, on this sacred ground, we lay this wreath in recognition of all the nurses who exemplify selfless service ... and voluntarily chose to serve in harm's way to heal and help others." Hollyanne Milley, a cardiac nurse, also attended the ceremony. She is the wife of Chief of Staff of the Army Gen. Mark A. Milley. While she had never been a nurse in the Army, she has served as registered nurse in a civilian capacity for 30 years now. "Nurses make a difference every day they go to work," Milley said. "They apply their clinical skills in their area of expertise and work with the entire medical team to deliver quality patient care. They are often the team member that spends the most time with patients, establishing a relationship with them and assessing and communicating their needs to the team." Milley said nurses are often the first to notice when a patient's condition changes, and are the ones who most often bring that to the attention of doctors. Nurses are also the ones that interact most often with patients' families, she said. "Nurses have the opportunity to educate and empower patients and their families," she said. "They offer comfort, compassion and support during very challenging times." As a nurse herself, Milley recognizes the unique roleArmy nurses serve play medical professionals. "Army nurses are more than just nurses working in the Army," she said. "They are a unique brand of professionals who care for our Soldier's and their families in performing their professional responsibilities; but who also are always ready to deploy into harm's way to perform those same duties as Soldiers themselves, under the most austere conditions, to save lives and preserve function. "Happy Nurse's Week and thank you for the meaningful work you do every day!" Milley said.